Build farms are network clusters of nodes with high CPU performance which are dedicated to build software. The general approach consists in running tools like "distcc" on the developer's workstation, which will delegate the job of compiling to all available nodes. The CPU architecture is irrelevant here since cross-compilation for any platform is involved anyway. Build farms are only interesting if they can build faster than any commonly available, cheaper solution, starting with the developer's workstation. Note that developers workstations are commonly very powerful, so in order to provide any benefit, a cluster aiming at being faster than this workstation still needs to be affordable. In terms of compilation performance, the metrics are lines-of-code per second per dollar (performance) and lines of code per joule (efficiency). A number of measurements were run on various hardware, and this research is still going. To sum up observations, most interesting solutions are in the middle range. Too cheap devices have too small CPUs or RAM bandwidth, and too expensive devices optimise for areas irrelevant to build speed, or have a pricing model that exponentially follows performance. Nowadays, most processors are optimised for higher graphics performance. Unfortunately, it's still not possible to run GCC on the GPU. And we're wasting transistors, space, power and thermal budget in a part that is totally unused in a build farm. Similarly, we don't need a floating point unit in a build farm. In fact, if some code to be built uses a lot of floating point operations, the compiler will have to use floating point as well to deal with constants and some optimisations, but such code is often marginal in a whole program, let alone distribution (except maybe in HPC environments). Thus, any CPU with many cores at a high frequency and high memory bandwidth may be eligible for testing, even if there's neither FPU nor GPU. First, software changes a lot. This implies that comparing numbers between machines is not always easy. It could be possible to insist on building an outdated piece of code with an outdated compiler, but that would be pointless. Better build modern code that the developer needs to build right now, with the compiler he wants to use. As a consequence, a single benchmark is useless, it always needs to be compared to one run on another system with the same compiler and code. After all, the purpose of building a build farm is to offload the developer's system so it makes sense to use this system as a reference and compare the same version of toolchain on the device being evaluated. The most common operation here is what is called a Canadian build. It consists in building on machine A a compiler aimed at running on machine B to produce code for machine C. For example a developer using an x86-64 system could build an ARMv7 compiler producing code for a MIPS platform. Canadian builds sometimes fail because of bugs in the compiler's build system which sometimes mixes variables between build, host or target. For its defense, the principle is complex and detecting unwanted sharing there is even more difficult than detecting similar issues in more common cross-compilation operations. canadian build from developer's system to tested device for tested device. This results in a compiler that runs natively on the test device. native build on the test device of a cross-compiler for the target system using the previously built compiler. Since that's a somewhat painful (or at least annoying) task, it makes sense to back up resulting compilers and to simply recopy it to future devices to be tested if they use the same architecture. This test consisted in building haproxy-git-6bcb0a84 using gcc-4.7.4, producing code for i386. In all tests, no I/O operations were made because the compiler, the sources and the resulting binaries were all placed in a RAM disk. The APU and the ARMs were running from a Formilux RAM disk. OK then we have an easily reproducible reference value : the test set consists of 458870 lines of code. 2016/02/07 Pcduino8-uno armv7/cortex A7 AllWinner H8 1.8/1.8 GHz** 8 8 1 GB DDR3 32 ? 2017/02/12 OrangePI-PC2 armv8/cortex A53 Allwinner H5 1.296/1.296 GHz 4 4 1 GB DDR3 32 ? 2018/06/07 OrangePI One Plus armv8/cortex A53 Allwinner H6 1.8/1.8 GHz 4 4 1 GB DDR3 32 ? * : the device claims to run at 1.8 GHz but the kernel silently ignores frequencies above 1.608 GHz! ** : the device doesn't let you configure this frequency despite being sold as a 2.0 GHz device! *** : the device claims to run at 2.016 GHz but the kernel silently ignores frequencies above 1.536 GHz! ****: the device used to have the same problem but is now fixed upstream thanks to the vendor's reactivity! And the results are presented below in build time for various levels of parallel build. 2015/01/18 C2Q 4 8.77 52323 4360 L3 cache not shared between the 2 dies. 2015/01/18 Cubietruck 2 141s 3254 1614 Cortex A7 is very slow! 2016/03/12 ODROID-C2 4 27.96s 16410 2671 ... respectively for 1, 2 and 4 processes. 2016/07/26 mqmaker MiQi 4 45.2s 10152 1578 very slow by default, DDR3 runs at only 200 MHz! The Core2quad is outdated. It's exactly half as powerful as the new core i5 despite running at sensibly the same frequency. ARMs do not perform that well here. The XP-GP achieves the performance of one core of the C2Q using all of its 4 cores. Since it's running at half the frequency, we can consider that each core of this Armada-XP chip delivers approximately half of the performance of a C2Q at the same frequency in this workload. The Atom in the EEE-PC, despite a slightly higher frequency than the Armada-XP, is not even able to catch up with it. The APU platform is significantly more efficient at similar frequency than the Atom, given that it delivers per core at 1.0 GHz the same performance as the Atom at 1.86 GHz. However the atom can use its HyperThreading to save 25 extra percent of build time and reach a build time that the APU cannot achieve. The conclusion here is that low-end x86 CPUs such as the Core i3 3217U at 1.8 GHz should still be able to achieve half of the Core i5's performance, or be on par with the C2Q, despite consuming only 17W instead of the C2Q's 77W. All x86 machines are still expensive because you need to add memory and sometimes a small SSD if you cannot boot them over the network. Given the arrival of new Cortex A17 at 2+ GHz supposed to be 60% faster than A9s clock-for-clock (Armada XP's PJ4B core is very similar to A9), there could be some hope to see interesting improvements there. If an A17 could perform as half of the i5 for quarter of its price (or half the price of a fully-equiped low-end i3), it would mean a build farm based on these devices would not be stupid. As expected, the Cortex A17 running at the heart of RK3288 shows a very good performance, and a single core performs about 80% faster than Armada XP's clock for clock. This is visible in the single core test which shows exactly the same speed as two cores on XP-GP, and the two-core test which is almost twice as fast on the RK3288. However, this 4-core CPU doesn't scale well to 3 nor 4 processes. The very likely reason is that not only the RAM is limited to a 32-bit bus, but it runs at 792 MHz only. In comparison, the Armada XP is powered by 1600 MHz in 64-bit, resulting in exactly 4 times the bandwidth. The 4-core run on the RK3288 was only 67% faster than the 2-core one. Linear scaling should have shown around 21 seconds for 4 processes instead of 25. It is possible that other devices running faster DDR3/DDR3L and more channels would not experience this performance loss. That said, this device is by far the fastest of all non-x86 devices here and is even much faster than all low-end CPUs tested so far. 4 cores of RK3288 give approximately the same build power as one core of an intel core i5 at 3 GHz. The device is cheap (less than 75 EUR shipping included) and can really compete with lwo-end PCs which still require addition of RAM and storage. For less than 300 EUR, you get the equivalent of four 3GHz intel cores with 8 GB of RAM, and it is completely fanless. Comparing clock speed and core count, the Cortex A7 in the cubietruck is the slower, but it's still more or less on par with the Sheeva core in the Armada XP which is normally comparable to a Cortex A9. Here it suffers from a very low frequency (1.008 GHz) but possibly the big.Little designs offering it as a high-frequency companion to an even faster Cortex A15/A17 can bring some benefits. 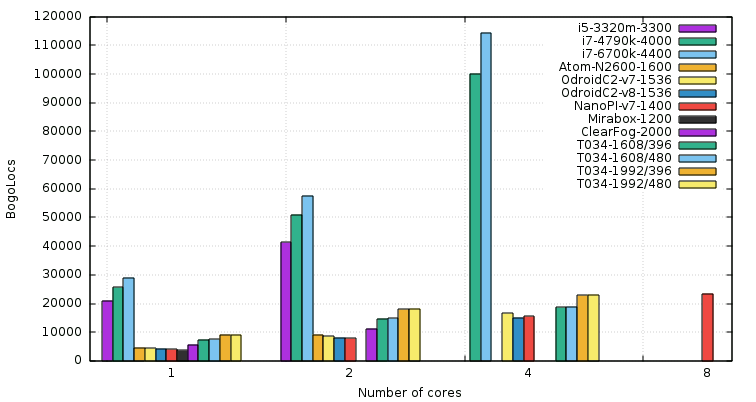 The Cortex A17 cores in the T034 are 26% faster than the Atom 2600 cores in the EEEPC. However, the Atom manages to catch up when it uses Hyperthreading. It's said that newer Atoms are about 20% faster so they could catch up with it without Hyperthreading, and manage to be twice as fast in their quad-core version. The intel Core as found in the Core i5 is performing very well, but hyperthreading brings little benefit here (13%). Thus a CPU should be chosen with real cores (eg: newer code-core i5 vs dual-core quad-thread i3). The Phenom is performing quite well also, especially if we consider it's an old platform of the same generation as the Core2. Also, newer CPUs are proposed with many cores (4-8) and a high frequency (4+ GHz) leaving hopes for a very fast build platform. Concerning the costs, An AMD diskless platform can be built for about 400 EUR with eight 4 GHz cores, 4 GB RAM, a motherboard and a power supply. Such a machine could theorically deliver around 160 kloc/s. The ARM-based T034 would require 9 machines to match that result, and would cost about 675 EUR + the switch ports. However it would take 10 times less space and would be fanless, silent and eat a third of the power. It seems reasonable to expect that a big.Little machine running 4 cortex 15 cores at 2 GHz and 4 cortex A7 cores at 1.3 GHz could reach 25 kloc/s. Such a machine could be made for around 150 EUR using a Cubietruck 4 or an Odroid XU3 board. But compared to the other solutions, that's even more expensive (around 900 EUR for 160 kloc/s). Maybe entry-level Atom-based motherboard with an external power supply can compete with the AMD if one manages to find them at an affordable price. In this test, the AMD was the fastest of all systems, and the ARM was the fastest fanless system and also the one delivering the highest throughput per cubic centimeter. The PCduino8-uno is quite an interesting device. For $49, you get 8 cores running at 1.8 GHz (it's advertised as 2.0 GHz but that's wrong, cpu-freq refuses any frequency above 1.8 GHz). The processor is very similar to the A83T. It supports DVFS (dynamic voltage and frequency scaling) and automatically adjusts its frequency based on the temperature. This is a benefit for hardware vendors who can easily overclock CPUs and advertise the highest possible frequency, at the expense of the consumers who find them slow because these devices throttle themselves. The PCduino8-uno is no exception, after 2 or 3 seconds, it slows down to only 4 cores running at 480 MHz, and completely stops the 4 other ones. The temperature thresholds are extremely low (it starts to throttle above 50 degrees). This thermal throttling can be disabled, but at exactly 100 degrees, the device will shutdown, making it really useless for anything. By writing to the proper CPU register, it's possible to also diable the thermal shutdown. The CPU then runs find at up to 121 degrees, and froze at 128. Installing a 4cmx4.5cm heatsink on this device was not easy, but adhesive heatsinks of 3.5x3.5cm can easily be found on the net. With this heatsink, the temperature rarely exceeds 80 degrees. This combined with a disabled thermal throttling is enough to let the device *really* work with all 8 cores at 1.8 GHz. The test with 4 processes shows that the memory bandwidth starts to limit the build performance. According to the datasheets, the DRAM bus is only 32 bits, which starts to be a bit short for 8 build processes in parallel. No information was found on the DRAM frequency though it's expected to be between 800 and 1066 MT/s. The test with 8 processes exhibited an issue that never appeared in previous tests and which is worth considering for future hardware choices. It happens that haproxy contains 4 very large C files, each consuming between 8 and 20 seconds to build. So when these files are picked in the middle of the build process, they can be left alone on one or two cores with the other ones idle waiting for them to finish. The only way to improve the situation is to force these files to be built first so that the other smaller ones can be built in parallel. Regardless on the number of cores or available machines, it indicates that the build time using such hardware will never go below 20 seconds. This shows the importance of raw performance. It's also interesting to note that at similar frequency, the RK3288 in the T034 is exactly as fast as the H8 in the PCduino8-uno but with half of the cores. Thus it will deliver the same build performance with half of the latency (ie with enough nodes it will be possible to go down to 10 seconds instead of 20). But for workloads involving many small files, the PCDuino8-uno is 30% cheaper, though it requires some hardware adjustments. Other very cheap CPUs exist, such as the H3 (quad core 1.2 GHz). Some are sold overclocked at 1.6 but cannot sustain this frequency when used. Users report that 1.2 is the maximum stable frequency with a heatsink. When the price of a power supply, a microSD card, and a switch port are added, they're probably not interesting anymore, being 3 times slower than the H8 at 1.8 GHz for around $10-$15. Since we don't have enough small files in haproxy to maintain all cores busy during most of the time, a new test was run with distcc running on the t430s, involving various combinations of itself, the pcduino8-uno and the t034. A first test showed that the t034 would periodically segfault on the Linux kernel and refuse to run distccd on the Android kernel, apparently due to selinux preventing a non-root process from creating a socket. The crashes were caused by the Linux kernel running the memory at 456 MHz while the Android kernel was running it at 396 MHz. A new device tree was made to fix this. As can be seen, the cortex A17 in t034 delivers exactly the same build time with half of the core as the cortex A7 in the pcduino8-uno, so for this workload both machines are interchangeable, thus the pcduino8 is cheaper for the same level of performance, and that these two machines combined achieve almost the same level of performance as the t430s alone. When the t430s is used only by distcc, it's pretty clear that it can easily handle about 6 such machines before being saturated. Thus it should be possible to make the build time go as low as about 45 seconds with 6 machines (it's 2mn09 natively). 6 pcduino8 will cost about $300 plus the microSD cards and the heatsinks and power supplies. This can be cheaper than an x86 equivalent, consume less power and remain fanless. It is expected that the Odroid XU4 board would deliver approximately 1.5 times the performance of these machines for 1.5 times the cost of the pcduino8. It would also have a much lower latency than the pcduino8, making it suitable to build projects using large files. Such an option might be really worth considering in the future. New cheap boards involving cortex A53 (64-bit) still run at too low a frequency to be of any use here. By making use of the "pump" feature of distcc, it might be possible to further increase the number of nodes, at the expense of a bit more constraints. FriendlyARM proposes a 1.4 GHz quad-A9 for only $23 with 1 GB RAM and native gigabit connectivity. This board while theorically slower than most of competitors above is only 1/3 of the price of the quad-A17 for half of the power. It might represent an interesting device when lots of files have to be built (eg: Linux kernel). We finally ordered a few FriendlyARM NanoPI2 boards. And as friendly as they are, they even offered us two extra boards for free, which is awesome! One is the NanoPC-T2 which runs on the exact same CPU as the NanoPI2 (4xCortex A9 Samsung S5P4418 at 1.4 GHz), and the other one is a very new 64-bit NanoPC-T3 (8xCortex A53 Samsung S5P6818 at 1.4 GHz). This last one is very new, the image was not yet on the site when the board arrived. The board is almost exactly the same but with a different CPU. Since the new board is marked "NanoPC-T2/T3", we suspect that the same board will be used for future batches (the CPUs have identical pinouts). As anticipated, the Cortex A9 is not very fast. Clock for clock, it's even a bit slower than the XP-GP board which runs with 64-bit memory at 1600 MHz. But the board is amazingly cheap, really small and extremely convenient to build a stack of machines. Two of them fit in the hand, and there are mounting holes supporting M3 screws. The power and RJ45 are opposed and there's no need for any side connector, so it's very easy to build extremely compact machines with these boards, much more than it is with the T034 board in fact. It was noted in some memory bandwidth tests that the simple fact that the video controller is enabled consumes 25% of the memory bandwidth. The only way we found to disable it right now is to freeze lightdm and kill X11. Otherwise even in console mode the framebuffer runs at a high resolution wasting memory bandwidth. The tests above were run under such optimal conditions. We'll have to rebuild a kernel completely disabling HDMI support to get optimal results in the future. The NanoPC-T3 is an interesting beast. Per core, it delivers the same performance level as the Odroid-C2 but at a 30% lower frequency (1.4 GHz instead of 2.0 GHz), while it's supposed to be running on the same A53 cores. Maybe the memory controller makes a difference here. (Update 2016/07/09: the Odroid-C2 really runs at 1.536 GHz, see below). And with all 8 cores combined, it's the first ever non-x86 board we see here which crosses the 20s build time limit (19.2s) when building for x86_64. It becomes obvious that the memory bandwidth becomes a bottleneck with so many cores but despite this it's faster than other boards. Initially we thought the limited scaling at high process counts was caused by limited memory speeds, but given that the user time almost doesn't change (2m02 to 2m05) between 6 and 8 processes, it only means the CPUs simply don't have any extra job to run. The CPU would definitely deserve a bit of overclocking to 1.6 GHz to keep up with the RK3288 on similar core counts. It could then be used both for small and large projects without hesitating. There is an important point we forgot to mention above regarding the heat. Both boards stay really cool, but during builds they start to heat a little bit. The 6818 includes a thermal sensor which the 4418 doesn't have. There is some form of automatic thermal throttling once the temperature reaches 87 degrees C. The 4418 doesn't appear to have any such feature, though in practise we've seen it occasionally report 800 MHz instead of 1400 for a few seconds during build despite being forced in "performance" governor. Using a very small heatsink the size of the CPU and 6mm high is enough to keep the CPUs cool below 70 degrees during build so that it never throttles. It is important to use low profile heatsinks when you want to stack the boards. We're now impatient to see a NanoPI3-Fire board equipped with the S5P6818. It would by far be the best board to build a server farm. The board design is so convenient, it doesn't contain any useless chips, and it's reasonably cheap. In the mean time we need to figure if it's possible to run these CPUs at a higher frequency. Since we're not using the GPU at all we can reuse a part of the thermal envelope for raw CPU power. Update 2016/07/07: there's now a NanoPI-M3 with the same components and characteristics for only $35. It's very cheap for that fast of a board. We ordered one but couldn't resists installing it in a robot so it's not part of the farm! MQMaker makes the MiQi board, an RK3288-based board. It's slightly larger than the T034, but has mounting holes, eMMC on board, and uses the two memory channels from the SoC. Also it's cheaper at $40. We've ordered one to see how it performs. A while ago we've noticed that some devices were reporting a cpufreq value higher than reality. The first one to show this was the T034, and RK3288-based HDMI stick. It advertises 1.8 GHz, but showed exactly the same performance at 1608, 1704 and 1800 MHz, proving that it was running at 1608 MHz instead. This was later confirmed when digging into the code where there is a "safety lock" to prevent the CPU from going above 1608 MHz (found as "SAFETY_FREQ" in commit 611037b "rk3288: set safety frequency" of the Firefly kernel that everyone uses). In several newer versions of the T034 sold as CS008, you can randomly find fake DDR3 RAM chips which are in reality DDR2. It is visible because some of them are marked K4B4G1646 which should in fact be a 512MB DDR3 16bit chip of a completely different package format, the true one is K3P30E00M (2GB DDR2 32bit). Recently while testing the FriendlyARM NanoPI3, we found it quite strange that being at 1.4 GHz, it was only very slightly slower than the Odroid-C2 supposed to be at 2.0 GHz when using the same number of cores (both Cortex A53). There is no doubt that the Odroid-C2 reports various frequencies among which 1000, 1296, 1536, 1752 and 2016 MHz. Doing some careful measurements will reveal that on the Odroid-C2, 1536, 1752 and 2016 MHz have exactly the same performance. Additionally, when running the ramlat utility, it will show that the L1 cache speed matches the CPU's frequency for all frequencies up to 1536 MHz and that for 1752 and 2016 it remains exactly equal to 1536. Thus that explains why the Odroid-C2 is so slow. The Cortex A53 isn't that slow in fact as proven by the NanoPI3, it's just running at too low a frequency. At this time we don't know whether it's a bug, it was added as a protection against overheating or it was made as a way to boost sales by advertising a higher frequency than reality. The numbers in the table above have been updated to reflect reality. Some tests run with the ramlat utility showed that the build time almost solely depends on the L1 cache speed, then a little bit on the L2 cache speed and then finally on the DRAM speed. It does not exactly depend on the memory bandwidth but rather latency. Some will say there's nothing new here, all those of us having assembled a very fast PC for development know that it is of uttermost importance to select the lowest latency DRAM sticks. But for the first time we have a model which reports almost the same performance numbers as the measures above by just looking at L1, L2 and DDR latency. Of course this is bogus though not that much. Thus we created a new unit for this metric, the "BogoLocs" (for Bogus Lines Of Code per Second). The principle of the measurement relies on a few observations. The first one is that a compiler walks across a lot of linked lists and trees. Such operations systematically require one pointer access to get the next element, and at least one read to study the data and know where to stop. Such data are often grouped together within a same cache line or are quite close. Linked list elements on the other hand have absolutely no relation and generally produce a random walking pattern across the memory space. The second observation is that most of the manipulated data are found in the CPU caches due to the fact that the compiler manipulates adjacent objects when it tries to optimize code. 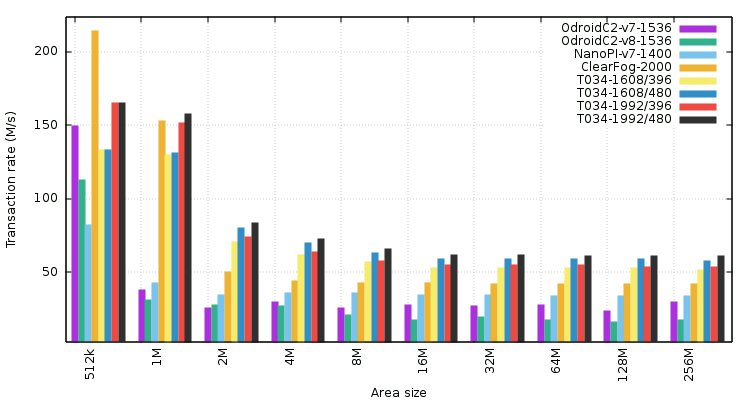 It then makes sense to consider that with a high locality, the both L1 cache and L2 cache hit ratios are high. We have graphed the memory latency metrics for a number of devices, most of them at stock frequency, some overclocked. The T034 is interesting because both its CPU and RAM were independently overclocked to show the effect of each. The graphs below report the transaction rate in millions per second for each device at various memory area sizes. Due to the number of columns, the first graph shows only some x86 devices which clearly exhibit the L1, L2, L3 and DDR performance, and the next graphs will show some ARM devices's cache performance and a zoom on their respective DDR performance. The x86 graph shows pretty visibly the L1, L3 and L3 cache sizes of all tested CPUs. It is worth noting that the L2 cache is per-core and is very fast on x86, with around 2 words read every 2 CPU cycles. The performance penalty when hitting the L2 is thus very minimal. This probably explains why the SLZ compressor performs so well. In general, x86 achieves in L2 areas as large as 256kB the performance that the best ARM chips achieve in L1 areas of 32kB. And similarly the performance achieved by x86 in DRAM is as good as or even bettern than what the best ARM chips achieve in L2 cache here. The ARM cache performance graph shows that L1 cache speed is only dependant on the CPU's frequency. For Cortex A9 and A53, the L1 cache allows to fetch two words every two cycles (and it was verified that one word is fetched every cycle). For the Cortex A17, two words are fetched every CPU cycle. This is a nice improvement. The T034 runs at two CPU frequencies, each tested at two DRAM frequencies. It's obvious here that the DRAM frequency has zero impact in all cache-related tests. The L2 cache latency is not good at all on these ARM devices, as can be seen between 64kB and 512kB. It costs 8 CPU cycles on the Cortex A53, 9 on the A9 found in the ClearFog, and 12 in the A17 found in the T034! This explains why the ClearFog (A9 at 2.0 GHz) now performs significantly better than the T034 (A17 at 1.6/2.0). Something was not shown here, the L1 cache performance of Cortex A9 and A53 occasionally showed a much lower performance for the 32kB area size so the tests had to be re-run. Some mentions were found in some datasheets about such caches to be 4-way set associative and physically addressed. Since we don't know which bits are used to address it nor where the process is mapped, it's very possible that 1/4 of it experiences some eviction when addresses conflict between the first part and the last one and that it should be considered as "24 to 32kB" instead when it comes to consecutive addresses. It should not be a problem in a compiler where the access patterns are more random and never exactly 32kB so the tests were re-run to get the correct numbers when needed. Regarding the ARM DRAM performance, it depends on a lot of things. First, the DRAM frequency shows its impact for the first time here on the T034 once the dataset doesn't fit in the 1MB L2 cache anymore. Second, the mode in which the CPU works (ARMv8 or v7) seems to have a big impact. While it doesn't make much sense, in fact it can impact the instruction sequence used to fetch the data, and possibly the ability for the cache to speculate some reads. In ARMv7-thumb2 mode, the "LDRD" instruction is used to read 64-bit pointers. It looks more efficient than what is used in v8. The ClearFog employs DDR3L at unspecified frequency. Being an "L" version it may have higher access times than the DDR2 found on the T034. Overall, the performance here is 4-10 times lower than on x86, so it is very important to minimize the risk of hitting DRAM whenever possible. By combining just the numbers above we can reproduce the build performance numbers across all architectures. For this we pick the L1 cache transaction rate from the 8kB line (it's stable across all products), the L2 cache rate from the 128kB line (stable across all products), and the DRAM rate from the 16MB line (stable as well). By considering 96% hit ratio in L1, 92% hit ratio in L2, an aggregate hit performance that cannot exceed 1/miss times the next layer, we get the following metric which approximates the number of lines of code per second measured on real devices. In the end it shows that the L1 speed is critical (directly depends on frequency), and that the DRAM speed is very important as well as it can quickly limit the shared L2 speed when the miss rate is too high and multiple cores are hammering it in parallel. At this point it's unknown whether using devices with 64-bit memory bus will improve the performance or not, but given that the dual-channel in PCs provide them with 128-bit paths, and their performance is much higher, we'd be inclined to bet on this. This month, mqmaker started shipping the cheapest ever RK3288-based board, the MiQi board. It caught our attention because the photos clearly show that this board uses 64-bit memory, thanks to the SoC's dual channel memory controller. So it was a great opportunity to see how such a board would perform with twice the memory bandwidth compared to other ones like the T034/CS008. So we ordered the small and cheap one ($35) and finally got a large one (2GB RAM/16GB flash) with all accessories (case, cable, heatsink) as the small ones are not built yet. That's really nice and professional from the vendor to honor orders like this. After publishing these results, the mqmaker team was very proactive and immediately applied the appropriate fixes to their kernel tree. We could retest this kernel with the fixes and observe a nice 8% improvement just thanks to the CPU frequency. After looking at the DRAM datasheets, the chips installed on the board are DDR3-1600 (hence 800 MHz). Thus there's no point limiting the memory controller to 528 MHz as is done in the default kernel to favor some boards using cheaper memory. We rebuilt a kernel with the DDR set at 792 MHz to match the datasheet, and the performance was even better. Now with only 4 cores this board achieves the performance of the 8 64-bit cores found in the NanoPI3 which itself is already very good. When sufficiently cooled (small heatsink and fan) it works reliably at 2 GHz, and at this speed, only two such boards are necessary to beat a core i5 running at 3.1 GHz! This board is excellent to host heavy applications such as a build farm, but maybe other usages as well. It's interesting to see that the Atom is still 28% slower than the RK3288 here. Both have the same memory bandwidth (DDR3-1600, 64 bits). However there is a very interesting point in favor of the Atom. It's etched in 14nm vs 28nm for the RK3288. It's 4 times smaller. And during the builds, it remains completely cold, even when the fan is unplugged. Touching either the heatsink or the board under the CPU doesn't make it possible to detect if it's powered or not! That's a very important point to consider because on the MiQi, a large heatsink is required to sustain 1.92 GHz otherwise after a few minutes the CPU starts to throttle down to 1.6-1.8 GHz to remain below 90 degrees and there the Atom can start to become competitive again. On the price point, the board is obviously more expensive than an ARM board but not that much, and actually is very cheap for an x86 board (~$90 with everything on it), while most x86 boards require that you add your own storage and sometimes even RAM. Networking is important in a build farm. This one is equipped with a Realtek 8111 or 8168 PCIe NIC. While it's far from being the most performant one, it's already much better than the stmmac device found on most ARM boards and it definitely counts to keep the overall build time low on large projects. The simple fact that it's capable of saturating the gigabit, supports HW tx/rx checksums, GSO and GRO makes it use much less CPU to transfer the files to compile, so that's more CPU saved for the compiler. 65536k 72 72 64 62 54 Strange! Last point, while it's a real pain to have to use a BIOS on a headless machine (it took about 2 hours to manage to install it, finding a working HDMI display, USB keyboard, then an erasable USB stick), those planning on connecting a display to such a board will be pleased to see a very complete BIOS with tens, maybe even hundreds of settings. On this point the ARM world still has a strong advance. You put your kernel and your initrd on a microSD, you plug the power cord and 6 seconds later you have SSH running. We definitely need to run more tests trying to disable the display (at the risk of of not being able to enter the BIOS anymore to re-enable it), to see if the RAM is faster and the build as well. As expected, it was the integrated display which was wasting the memory bandwidth. As initially guessed, reducing the graphics memory size from 512M to 32M has fixed the strange performance report above, all DRAM lines now show 72 M accesses/s. And totally disabling the IGD increases the overall performance by 5%. Unfortunately the BIOS doesn't allow to overclock the CPU nor to unlock the turbo mode to allow all 4 cores to run at full speed, so it seems we've reached the limits here. The results are quite good anyway! As already noticed a few times in the past we have the confirmation that ARMv8 code is significantly slower on this type of workload than ARMv7's Thumb2. It's not the CPU which is slower since it is the same and even the kernel remains 64 bit. It's only the compiler which is built in 32 vs 64 bit. The performance loss by switching to 64 bit is respectively 15% for the A72 core and 18% for the A53 cores! The ARMv8 version was built with gcc 6.3.1 and gcc 5.4, both showing precisely the same performance. Thus a good advice for an ARM-based build farm definitely is to stick to 32-bit userland. 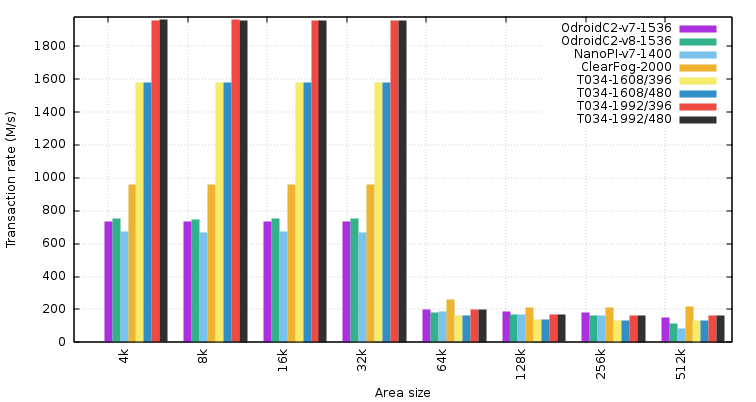 In addition, the A72 is surprisingly not faster than the A17 in LoC/s/GHz. In fact both designs are very comparable. The A72 however benefits from some extensions available only in ARMv8 (crypto, crc, ...) which make it way faster for certain applications. It will obviously be much faster for applications requiring 64 bit computing, which is not our case here. Sadly there are not many A17-based SoCs to compare their performance. The NanoPI Fire3 uses the exact same CPU as the NanoPC-T3 and is very similar, only the form factor changes. In fact it boots from the same image. The device tree for this board was reconfigured to make it run at 1.6 GHz which is the maximum frequency this CPU supports, instead of the base 1.4 GHz (with a bit more heating). It's worth noting that at 1.6 GHz in 64 bits the board delivers exactly the same performance as the other one at 1.4 GHz in 32 bits. This indicates a 12% performance drop when switching from 32 to 64 bits, which is lower than what was observed on the RK3399. It is also noticeable that these cores are respectively 18.9, 32.5 and 43.1% faster than the RK3399's A53 cores for 1,2,4 parallel processes, while the frequency only accounts for 11.5% here. So we definitely have a big problem in the RK3399, which could explain why it doesn't shine as expected. The growing difference with the number of cores indicates a shared bottleneck in the RK3399, likely the shared L2 cache or the RAM speed. When running ramlat, the NanoPC-T3 at 1.4 GHz shows 40M 32/64 bit accesses/s to the RAM. Larger accesses proportionally decrease in speed, indicating a 64-bit path here which corresponds to the datapath between the L1 and the internal data bus which can only deliver full 64-bit words (hence after two 32-bit accesses to the RAM via the L2). NanoPI Fire3 at 1.6 GHz shows 41M accesses/s, indicating that the CPU frequency has almost no impact there as expected. However the RK3399's A53 cores only achieve 28M accesses/s, or 32% lower. This certainly explains why the RK3399's is so slow here. But the same test on the A72 cores show 43M access/s, indicating there is in fact no bottleneck, we're in the same ranges as the NanoPI here. A memchr() based memory bandwidth test shows 1.27 GB/s read speed on NanoPI Fire3 at 1.4 GHz, 1.4 GB/s read speed on NanoPI Fire3 at 1.6 GHz, 0.9 GB/s on RK3399's A53 at 1.416 GHz, and 1.55 GB/s on RK3399's A72 at 1.8 GHz. So it appears that the NanoPI's cores and the A72 cores in the RK3399 all show a bandwidth which linearly scales with the CPU's frequency, which is already surprising but could in fact depend on the processing time of some instructions, indicating a slightly faster RAM than what the CPU can use. The A53 in the RK3399 however shows 30% less performance than expected. Thus there are two possibilities : either there's a bug in the way the A53's L1 communicate with the shared L2, or this bus is limited in width. the read speed per core is stable on 1 to 2 A72, and 1 to 4 A53, so we can get 2*1.55 GB/s on A72 and 4*0.9 GB/s on A53. This confirms that the L2 to RAM path is OK.
the write speed per core is stable up to two cores (A72 and A53) but divides by two from 2 to 4 A53. This indicates a smaller bus on writes from L1 to L2 for the A53 cores. The A53 specs from the ARM site indicates a 128 bit data path between L1 and L2. It could be possible that here Rockchip has decided to cut the read path in two for the A53 cores so that the 4 cores in the little cluster cannot take more than half of the total L2 bandwidth to maintain a level of fairness with the 2 A72 cores in the big cluster. This would also explain the slower memory accesses, as it then takes twice the bus time to transfer a 64B cache line between the L2 and the A53's L1. And given that this CPU was designed for mid-range set-top-boxes, it is not shocking to cut down the performance of the lower cores to cut on costs and/or power usage. So to summarize, the A53 in the RK3399 are far too slow to be usable for any memory-intensive workload compared to A53 found in other SoCs. Only the A72 are powerful here but they are only two. At this point for heavy workloads, the RK3399 really only constitutes a dual-core CPU, which is a shame. This explains why the RK3288 in the MiQi with its 4 A17 is way faster. The Odroid MC1's CPU is an Exynos 5422 featuring 4 "little" Cortex-A7 cores at 1.4 GHz, and 4 "big" Cortex-A15 cores at 2.0 GHz. It uses 64-bit LPDDR3 memory at 750 MHz (1500 MT/s). The CPU looks a bit faster than the RK3288, but the RAM is twice as slow as the one used on these boards like the MiQi (50 MT/s vs 100 MT/s), which is not surprising considering that the A17 in RK3288 is said to have a much improved memory controller; this explains why in the end we get sensibly the same performance level on MC1 and on MiQi. Arguably the MC1 is less expensive and comes with a large heatsink probably making it a better choice to build a small cluster. The little cores are really slow (A7) and cannot be used for compiling anything as could be seen during the test since involving them was enough to increase the build time. With some minor modifications to distccd, it would be possible to let the network and distccd work on the A7 and dedicate the A15 to cc1 only, probably saving a few extra tenths of seconds. Probably that tweeking the scheduler to force a CPU migration every time an A15 is idle would improve the situation, by using the A7 as complement only : the A7 here deliver roughly 43% of the A15's capacity, so adding them into the mix could at best shrink the build time to 14.7s under optimal conditions (which are never met). Even 16-17 would already be great. This is an inexpensive board, and the first one featuring a 1.8 GHz A53 CPU. The frequency is real and sustained when all cores are active provided that a large enough heatsink is installed on the SoC to keep it cool (verified with the "mhz" utility). However despite running at the same frequency, the performance is only half of what the MiQi shows. The difference is the RAM performance which is only one third of the MiQi's (33ns avg vs 10ns avg, 32 vs 64 bit). One part of the slowdown is also explained by the 64-bit code which we already noticed was slower. However when compared to the OrangePi PC2 featuring an H5 at 1.5 GHz, this board compares favorably. Note that despite running at a much higher frequency than the NanoPI-Fire3, the OrangePi is still significantly slower. Overall it turns out that Allwinner chips area really not suitable to be used in a build farm, whatever the generation. It's likely that they are optimised for power draw in tablets and set-top-boxes, but not at all for efficient I/O nor memory accesses. This is a server board equipped with a powerful processor and rich I/O. As usual, Marvell has put a lot of I/O bandwidth on this board which has no problem delivering 20 Gbps of traffic. While the price point doesn't make it suitable at all for a build farm, it's fanless and may be used as traffic generators which by definition are not used all the time, so this makes a great opportunity to use them for building as well. The CPU is a Marvell Armada 8040 containing four 2.0 GHz A72 cores. The memory is a 64-bit DDR4 DIMM at 2400 MHz. The ramlat utility shows the same access time as on the MiQi. In fact the A17 and A72 memory controllers are very similar, since the A72 is more or less the 64-bit version of the A17. Here this board has beaten all ARM boards by a noticeable margin, being the first to cross the 5 kloc/s/GHz/core barrier, the first one to cross the 30kloc/s barrier, and it even delivers slightly higher performance per core than the Core2-Quad clock-for-clock, indicating a certain level of maturity in the A72 design. The performance per core and per GHz is 29% higher than the A72 in the H96 box, clearly indicating a problem with the RK3399 memory controller, with the RAM installed in this machine, or simply with its settings. The MCbin proves the A72 can be powerful. The global performance per core only drops by 25% from 1 to 4 core, which is quite good, only the Odroid-MC1 and x86 machines manage to do slightly better. It might make sense to optimize the build farm to focus on 3 processes per machine since the performance drop is more marked from 3 to 4 processes. The big cores even support 2.208 GHz with a small voltage increase (the datasheet recommends 1.25V as a limit), but lose stability above 80 degrees, which is the datasheet's recommended maximum operating temperature, and which can be reached when all 6 cores are saturated (12 to 15 watts consumed). The gain obtained by overclocking the large cores only remains low and not worth the increased power consumption and decrease of stability. Thus it looks like the best combination for this machine is to run the small cores at 1.8 and the large ones at 2.0. At this performance level, the machine draws roughly 8 Watts and builds 20% faster than the stock settings. The MiQi's top speed remains faster but the MiQi is very hard to cool down while the NanoPI-M4 comes with a very efficient heatsink requiring no effort. Given the easier setup that this board provides, it becomes more interesting than the MiQi and could represent the best performance to price ratio if the preparation time has to be considered. A last test consists in running a compiler built for a 32-bit armv7t platform. As already observed earlier, it's way faster (21%). In this mode this machine becomes faster than the other ones. However the build time varies depending on where the files are placed (though placing the smallest ones on the little cores should help). Interestingly, building for x86_64 is even faster in native mode this time (13.3s in armv8, 15.0 in armv7). It looks like gcc is significantly slower when building for a different word size, so it would mean that there is a real interest in using a 64-bit machine with dual libs and an armv7 compiler for 32-bit outputs and an armv8 compiler for 64-bit outputs. Another test shows the problem with the A53 cores and the memory controller : running ramlat on a single A72 shows ~50 MT/s on a 16 MB window. Running it on the A53 shows ~12 MT/s. But running it on two A53 in parallel shows ~25 MT/s on each of them, totaling 50 MT/s. This means that the presence of a second A53 increases the performance of the first one. It looks as if the memory controller was aggressively going to power saving mode when a single A53 uses it. Maybe they decided that two A53 or one A72 are needed to switch to performance mode. And this fixes the issue affecting the A53 cores, the performance is now around 32 MT/s for a single core, 58 for two, 66 for three and 69 for four. However, doing this doesn't affect the build time at all, most likely since very little time is spent with only one A53 core running, which is the situation where the DMC goes to low performance. While it's definitely not fast, as one could expect from the low memory bandwidth inflicted by the low-power DDR2 memory used on the board, it's not the slowest either. The board needs to be cooled with a moderately sized heatsink (approx 4x4x1cm) otherwise it will throttle before completing the test. The performance is on par with other A53 cores running at comparable frequencies when their memory controller is not properly configured, such as the A53s found in RK3399 which for whatever reason have an extremely slow access to the main memory by default. However for the same price, same power draw, an even lower footprint and coming with the heat sink, the NanoPi-Fire3 remains a better option, being 70% faster. This is a board designed by t-firefly and built by LibreComputer. It runs an intersting SoC equipped with GigE and USB3. This board could possibly make a very good USB-based NAS. The CPU is an RK3328, featuring 4 A53 cores at 1.4 GHz. The board comes with 2133 MHz DDR4 attached to a single 32-bit channel. The memory controller works better than in the RK3399, as a single core reaches 60 MT/s and two cores 70 MT/s. But despite this, the build performance is not impressive, being 13% slower than the NanoPC-T3 running at the same frequency, or only 16% faster than the RPi3B+ also running at the same frequency. So overall this board is not the best choice for a build farm, but it could very likely be one of the most interesting ones for high I/O performance given its connectivity and RAM speed. Hardkernel has set up a bench platform at maze.odroid.com (see the details here) where their different boards can be accessed for benchmark purposes. This is an awesome idea because most of the time you want to test a board before deciding if it's the one that suits your needs. Thus we've uploaded the build farm benchmark tools there to run a test on the very new Odroid-H2 board. This small fanless board runs a quad core Celeron J4105 at 2.4 GHz (2-4 cores) or 2.5 GHz (single core), as indicated with the "mhz" utility. This CPU comes second just after the core-i5 in number of lines per second per core per GHz, and is as fast as this CPU for 4 processes, which is extremely good. Depending on this board's final price, it may constitute an excellent choice for a build farm, being fanless and using fast cores. Using fast cores is especially interesting for small projects having to build few files, because the level of parallelism is not great, and the total build time can be dominated by the last files to be built. It is likely that for the same build capacity it drains more power than ARM boards though, this has to be verified. Thus the Odroid-H2 definitely is a board to watch!